Calling all of my massage therapists in a tizzy on Sunday morning, I had hoped to schedule a same-day appointment. To my dismay, none were available. So I did the next best thing. I scheduled an appointment for Monday morning. His uncertainty irritated me, and I immediately wished he was better about remembering details. I mentally calculated the time it would take to get approximately to his cousins’ and assumed I was fine with my appointment. I suggested he set an alarm as I wouldn’t be there to ensure he was awake and told him that I’d get home so we could leave straight away. And he still didn’t have an answer. Half-asleep, he told me, I’ll find out. Just go. I didn’t have a lot of stock in this brunch thing, so I put on my favorite pair of tie-dye yoga pants and left the house. After my massage, I assumed I’d have a few minutes to stop in the store next to Massage Envy for a quick peek. I figured it would take about a half hour to get to brunch, and I definitely thought Brian would still be slowly waking up. His own mental calculations had done their due diligence and he realized I was probably hungry…and looking forward to brunch, as it’s one of my favorite meals. Well, guys, I’ve learned something about myself, and it’s that food is always a priority. Hunger set in immediately. Then panic. Then joy. My heart was racing a mile a minute, and I thought I might have a full-blown meltdown as I ran into the house, climbed the stairs and hunted for my slothwear. It’s kind of amazing and crazy how excitement, anxiety, and fear all kind of have the same feelings inside you. I didn’t know whether to run, scream, or cry. I thanked God I had recently cleaned because I knew the sloth shirt was hanging in the closet and my sloth socks were paired in my sock drawer. I painted on a little lipstick and eyeliner, brushed and dry-shampooed my hair, and ran back downstairs. 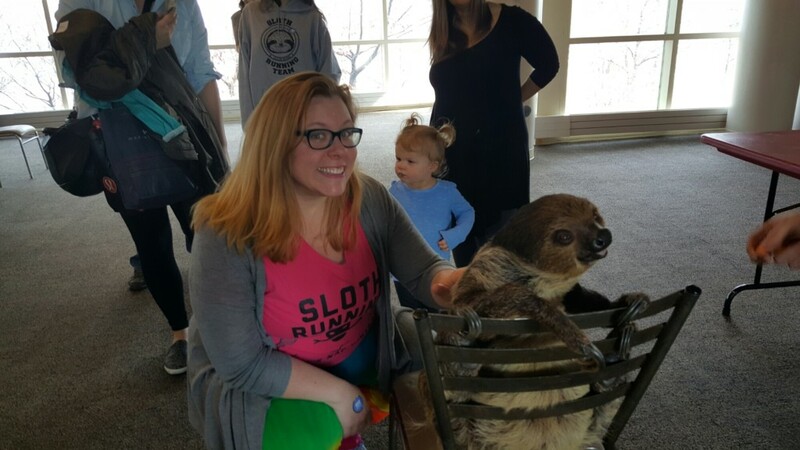 I was panicked and pumped and nervous and thrilled and couldn’t even believe I WAS GOING TO MEET A SLOTH!! I probably would have, but you guys…Brian was taking his day off work to DRIVE into the city and take me to see the sloth, even though we all know he would have much preferred to be at home sleeping and vegging out. Brian’s cousin texted and said the sloth was last, so unless we were an hour late, we wouldn’t miss him. We missed the flying fox, hedgehog, and fruit bat, but we got to meet a chinchilla, armadillo, kinkajou, and bat-eared fox before the main event. There he was. In all his Steve glory. I loved him as soon as I saw him. He clung to the chair and languidly moved, enjoying the tasty sweet potatoes from his trainer. As he appeared a mere fifteen feet in front of me, looking so adorable, tears started splashing down my cheek. It was really real. He was there. And I would get to pet him. I got in line between several toddlers who had no idea how lucky they were. The woman in charge said we (all the toddlers and I) could give Steve two pets. But I gave him three, and I made them last. Slow and gentle, just like Steve. You can see where my eyes say, “I’m going for the third pet” in the video Brian was kind enough to capture for me. We stayed until Steve left, watching him, soaking in all the amazingness of Steve and his slothy goodness. Afterward, Brian and I walked around Lincoln Park Zoo and saw ANOTHER sloth! It was pretty much the best day ever. And Brian has since learned that surprises are not my forte. My red face? That’s because of the crying.